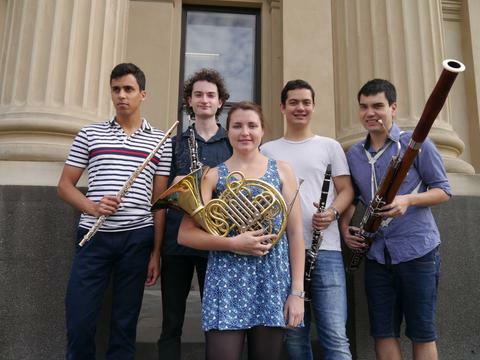 The Arcadia Quintet was formed in 2013 by five like-minded young musicians who share a passion for wind chamber music. 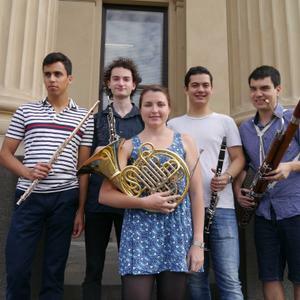 All current or former students of the Australian National Academy of Music (ANAM), Kiran Phatak, David Reichelt, Lloyd van’t Hoff, Matthew Kneale and Rachel Shaw have played together in various combinations for a number of years. In November 2013, they won first prize in the ANAM Chamber Competition for their performance of Ligeti’s Six Bagatelles for Wind Quintet, and were awarded an ANAM Fellowship shortly thereafter. Committed to music education and outreach, the group believes the wind quintet is an outstanding chamber medium that can rival the very best string quartets.